Premeditated Peppermint by Amanda Flower is the third book in the cozy Amish Candy Shop Mystery series. Each book in the series features it’s own mystery to be solved so they can be read as a standalone if choosing to do so. However, there is character development that carries over from book to book so it’s most enjoyable to read from the beginning. The main character in this series, Bailey King, was working in New York as a chocolatier before she decided to return to Harvest, Ohio and help her Amish grandmother run their family owned candy shop, Swissmen Sweets. Just when Bailey is experimenting with a new peppermint treat for her first Yuletide in Harvest she gets an unexpected visit from her ex, Eric. Eric has brought a whole film crew to Harvest to hopefully include Bailey and her Amish ties in his television show but when the executive producer is found strangled to death Eric instead becomes the prime suspect. With Bailey caught in the middle between her new love interest, Aiden, who is a sherriff’s deputy and her ex as the suspect Bailey knows she needs to solve this murder and quickly. 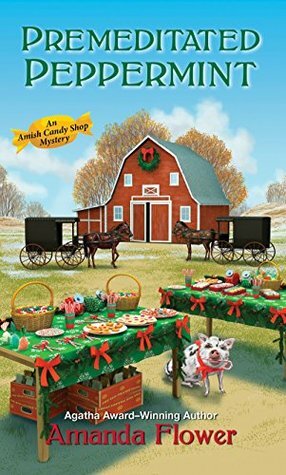 I’ve followed the Amish Candy Shop mystery series from the beginning and have absolutely loved what Amanda Flower has done bringing in a regular American character into the Amish community. Each book in the series has been a lot of fun so far, this one included, although I will admit to a slight hesitation to bringing in a sort of love triangle to this installment leaving this one only at stars. However, the character and charm of the small town quickly won me back over after the hesitation and it’s still one of my favorite cozy series. Amanda Flower is a three-time Agatha Award-nominated author. She also writes the USA Today bestselling Amish Quilt Shop Mysteries, including Murder, Served Simply and Murder, Simply Stitched, under the name Isabella Alan. Visit her at amandaflower.com. Wonderful review Carrie. I am looking forward to this one. Amanda Flower has become one of my favourite cozy authors. I have not read a bad one. I listened to the first two on hoopla recently and loved them. It is a fun series.